Above: Dead honey bees - a link to an explanation of what happened here can be found below. You may also find dead bumblebees or solitary bees. Finding dead bees can cause concern, but if you have found dead bees in your yard, garden, beneath a tree or simply on the pavement, there are various possible explanations, depending on the species and circumstances. Sometimes, the causes are natural rather than sinister. All creatures live then die, either due to age, disease, weather, natural predators and so on. Pesticides are certainly a cause for concern - see the links in the navigation bar right for further information - there is much information on this website, especially with regard to neonicotinoids. Most individual bees have very short life spans – as little as a few short weeks. The only exceptions within a colony are the queens. You can read more on my page: How Long Do Bees Live? Is it one particular species in one specific location? Or are there several different species of dead bees? Are the bees dead in the nest and can any parasites or strange webbing be seen? Or are there different species, and is the location scattered widely? Are there any other insects, also dead, such as butterflies, hoverflies and so on? Have You Found Dead Bumblebees? If you have found dead bees – usually up to around ten, all within a confined area, and you believe they are bumblebees, then most commonly this is part of the normal bumblebee colony lifecycle. Bees will clear out their nests to preserve hygiene, and this includes removing dead bees. The possible reasons for the death of these bees in the first place could be natural causes such as age, disease, or attack from a predator, resulting in casualties. Usually, there will be a nest nearby – although perhaps you haven’t seen it. Remember bumblebee nests can feature in a variety of places: high above ground (even in bird boxes), but also underground in abandoned rodent holes, or in clumps of grass. Please note too, that at the end of the season, in the vast majority of cases, only the new bumblebee queens will live and establish new colonies the following year, whilst the rest of the bumblebee colony will sadly not survive. A few exceptions are being reported (i.e. with bumblebee colonies surviving the winter), and there are differences in some warmer climates. Last year, my sister found dead bees by her pond. When I asked her for further information, it turned out they were bumblebees. They had made a nest by the water’s edge, and the dead bees were found around the entrance. More than likely, the reasons were part of the normal lifecycle and trials of an average bumblebee colony. If you have found many dead bees around the base of a tree, check whether the tree is a lime. 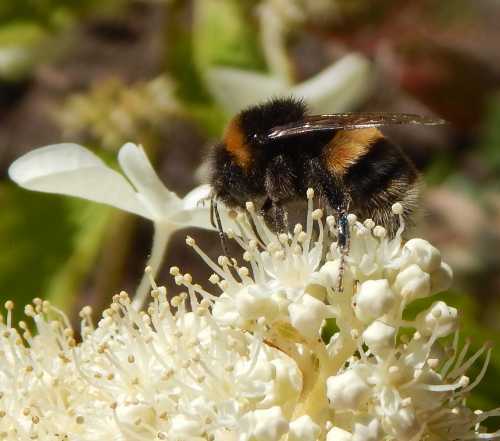 "Buff-tailed and white tailed bumblebees love the flowers of lime trees, although there is something in the nectar which seems to make them dopey and even sometimes kill them". So it seems some lime trees are toxic for bees – with some species believed to be more harmful for bumblebees than honey bees. Some of these lime trees are irresistible to the bees, but sadly they are fatal for them. I’m concerned about a trend to import ornamental species of lime for gardens without any consideration at all for the effects on local wildlife. Personally, I would like to see this behaviour regulated and banned where toxic effects are noted. Alternatively, has the tree been sprayed with pesticide? If so, it could be a case of acute poisoning (rather than chronic poisoning), and you may see other dead insects aound the same area. If you suspect poisoning, I recommend you collect evidence – dead specimens, photographs, and any information you can about the use of pesticides at the location, then report it to your local authority, or health and safety organisation. Some countries have specific places where wildlife poisonings are meant to be reported – check this with a relevant government body. Personally, I would try to keep back some of the evidence – copies of photos and a number of dead specimens, because the effectiveness of these schemes for reporting poisonings can be variable. Neonicotinoid pesticides are a particular cause for concern (see the links right). 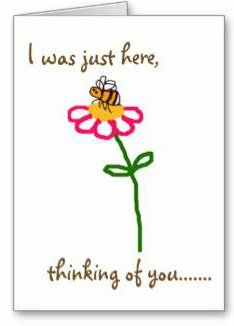 Have you found a dead bee (a single specimen), perhaps on the ground or even on a plant? Again, the reasons could be perfectly natural, for example, because of the age of the bee, due predator attack, internal parasites or disease. Some bees can be mistaken for dead, when in fact they are resting. If you have found a bee alive, but in need of a little TLC, go to this page. If you find a whole colony of dead bumblebees – i.e. in the nest, then it is likely that this is due to the invasion of a predator or parasite, and there may be visible signs of this, such as silky webbing (wax moth) or the parasites and their larvae may themselves be visible. If you come across an infested nest, sadly, there is generally little you can do to help the bees at this stage. Honey bee colonies are meant to survive the winter (see Where Do Bees Go In Winter). However, finding a few dead honey bees is perfectly normal. 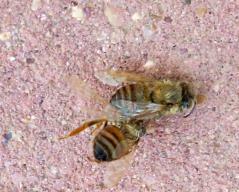 Again, dead bees are automatically removed from the nest or hive. During the winter, there will usually be more casualties, and this is known as ‘winter mortality’. Sometimes, honey bee colonies will succumb to inclement weather conditions during 'cleansing flights' - they leave the hive for a short while, but unfortunately they can get caught out if the weather suddenly turns against them. This was the case in the photograph at the top of the page, when in fact, many bees were found dead as a result of a snow storm You can read about it here. This is significantly different from the exceptional losses reported in recent years, with beekeepers losing around 30% of colonies or more due to colony collapse disorder (although this ‘condition’ is a term used to describe a number of phenomena, with variations in definitions and symptoms reported). Many countries have a system for recording collapses, and it’s important to record these incidences. However, it is my personal view that the impact of pesticides should also be considered, since they may significantly weaken the colony and make them more vulnerable to diseases. Read more about neonicotinoids and bees, and here are just a few examples that have been reported globally. Why do bees bump into windows? How Can councils Help Bees? Read more about bees nests. 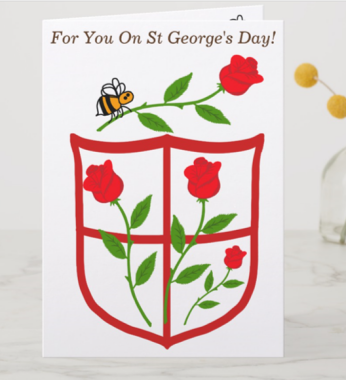 Find out more about bees - take a look at this introductory page. Why do bees buzz? How long do bees live? What are the differences between the types of bees? How do the bee life cycles differ...and more! Help bees by planting lots of flowers on which they can forage. There are lots of lists of different plant types here, and there are even plants for problem places. How do neonicotinoids work to kill insects like bees?